Initially, the 30° upward-looking lens is used along with the cautery hook on the right and the long tip forceps on the left. 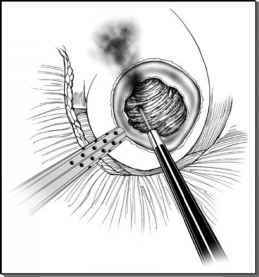 First, the peritoneal cavity is inspected and any necessary lysis of adhesions is performed. Next, the dissection is started just lateral to the medial umbilical ligament over the vas deferens (Fig. 3). The vas deferens is isolated and divided, care is taken to cauterize the deferential vessel, which courses along the vas. The dissection is continued anteriorly; lateral to the medial umbilical ligament and just above the bladder dome, and inferiorly until the pubic arch and external iliac vein are visualized. The majority of this dissection can be performed bluntly in an avascular plane. Care should be taken to identify the iliac vessels that are just lateral to the plane of dissection. This step is repeated on the contralateral side. Next, the medial umbilical ligaments are divided with electrocautery and the dissection is continued medially from either side until the urachus is divided. The bladder is then reflected posteriorly. Overlying fat is dissected off the pubic arch, endopelvic fascia, puboprostatic ligaments, and the prostatic apex. Care is taken to cauterize the soft tissue in the midline between the puboprostatic ligaments that invariably contain the superficial dorsal vein.